Spacious open-plan living room/bedroom with vaulted ceiling. Fabulous bathroom. Marian Cottage is in the grounds to the Chart House in Scilly Village. Ideal for those who want to enjoy the extensive leisure facilities available locally or the many friendly pubs and restaurants that have led to Kinsale being called the Goumet Capital of Ireland. 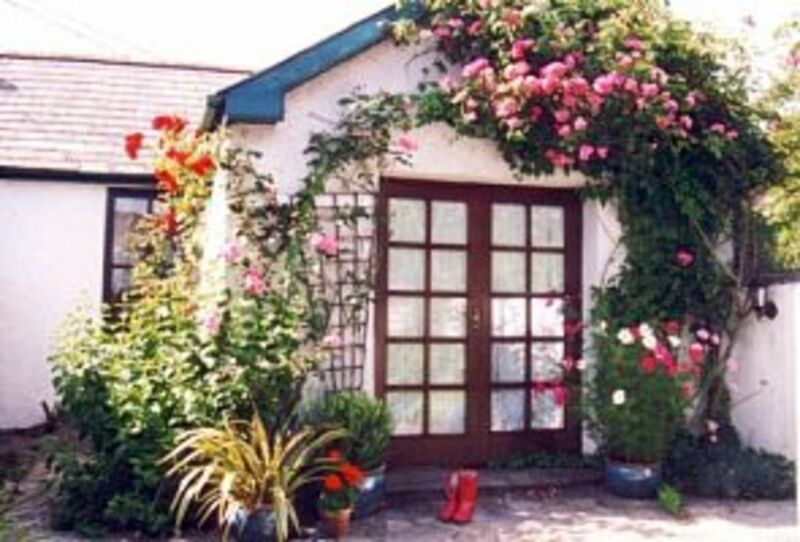 Marian Cottage is a 7 minutes' walk from Kinsale town centre where you will find many interesting shops, art galleries and museums. The properties have off-street parking and free WiFi. Marian Cottage sleeps 2+1 on sofa bed. Studio layout. Large bathroom with claw foot bath and separate power shower. Patio garden suntrap. Marian Cottage is next door to Cara's Cottage (sleeps 4) so they can be rented together for larger parties. Please note to book Cara's Cottage you will need to navigate to its own listing on HomeAway. Kinsale:: Winner of European prize for Tourism and the Environment, Entente Florale, National Tidy Town, Gourmet Capital - one of Ireland's oldest towns, with narrow streets and many historic buildings to explore; all sheltered by a beautiful harbour. Museums, historic forts, art galleries, craft shops, not to mention the 40+ bars and restaurants that give Kinsale its reputation for good food and that Irish only phenomenon called 'craic'. Oh, and the Guinness is good too! For the active: Choose from 3 golf courses including the spectacular and world renowned Links at The Old Head of Kinsale, deep-sea fishing, sailing or perhaps a harbour cruise. Maybe spend a day at one of the many 'empty' beaches nearby or perhaps visit the Norman built 12th century church of St Multose and 15th century Desmond Castle which houses the International Musem of Wine, or the twin 17th century forts guarding the entrance to the harbour to learn about our town that is one of the oldest in Ireland. Whatever is for you, you will find it here in Kinsale. Getting here: Is easy with direct flights to Cork from most UK and many European airports. Coming from America? Cork is only a 3 hours car journey from Dublin and 2 hours from Shannon Airport. If you're arriving by car Cork Ferryport, serving Roscoff in France, is only 14 miles away. And finally, as our properties are in the grounds to our house we are on hand if you need us. Just ask! We have lived adjacent to these cottages since 1999 and have been operating them as holiday lets since 2000. We have been subscribers to HomeAway and its forerunners all this time. We are usually around during your stay should you need assistance but the cottages are completely independent of our own house and we try to be as discreet as possible! Both cottages are located in Scilly, a village-like community 7 minutes walk from Kinsale town centre. Kinsale gets very busy in peak season so Scilly offers a quiet respite from the bustle in town while being within easy walking distance. We also have off-street parking which is a big benefit as parking in town can be hard to find when the town is busy in the summer months. The Spaniard Pub and Man Friday restaurant are within 1 minute walk of the cottages; 2 of the best pubs/restaurants in town! Please note that the accommodation is open-plan so all guest will be sleeping in the same room. This place was perfect for me and my 2 little boys. Great location. Thank you! Kinsale is situated on the south coast of Ireland, at the start of the Wild Atlantic Way, and just 15 miles from Cork and its International Airport. The town is the gateway to the wonderful countryside of West Cork and is famous for its gourmet reputation. Spaniard Pub and Man Friday restaurant within a minutes walk. Walk to town centre in 5 minutes, to find many many others. Charles Fort, museums and other historic sites all within walking distance. Beaches and sporting activities, including sailing, kayaking, horse riding and golf are only a few minutes drive away.